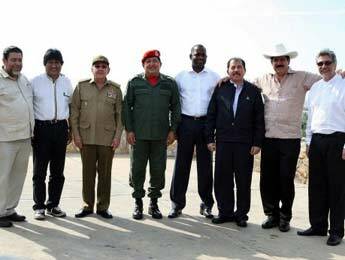 ALBA leaders, from left Ralph Gonsalves of St Vincent, Evo Morales of Bolivia, Cuba's Raoul Castro, Hugo Chavez of Venezuela, Roosevelt Skeritt of Dominica, Nicaragua's Daniel Ortega, Manuel Zelaya, Honduras, and Rafael Correa Ecuador. Dominica and other members of the Bolivarian Alternative for the Americas (ALBA) were today considering a new currency called the sucre that has been proposed by Venezuelan president Hugo Chavez. “It's a unique system of regional payment compensation that will have four bodies as a final system: one- the regional monetary council, two- the unity of common account sucre that will function as a virtual currency but with a an eye toward converting it in the future into a physical currency." "Today the Sucre will be born," said Chavez, speaking on live television with Cuban President Raul Castro. "In September, we should be ready to begin some pilot projects for exchange with that virtual currency ... by the first of January of 2010 we should have the system functioning," he said. He did not offer more details on how the currency would work. The announcement of an ALBA currency poses an obvious dilemma for the Dominica Prime Minister. Skeritt is on record as saying that he will not sign on to the new currency. However, given the importance being placed by Venezuela on the currency, one wonders whether he will be able to continue as a member without embracing one of its key precepts. From all accounts, the sucre will become the currency of choice for the ALBA grouping and full-fledged members would by virtue of the agreement, sign on to the new currency. Venezuela’s finance ministry recently said it hopes countries outside the ALBA trade bloc, including other nations in South and Central America and the Caribbean, will later join in using the currency. Any decision on the part of government to sign on to the new currency would necessarily result in Dominica having to rescind its participation in the Eastern Caribbean Currency Union; a position that have seen a stable currency (the EC dollar) anchoring the regional economies since the early 1970s. The question then becomes whether the government will risk upsetting its neighbors within the EECB grouping or if it will decide that it’s interests are better served by going with Cuba, Venezuela, Bolivia, Honduras, Ecuador and Nicaragua. That's a big one for Mr Skeritt...copawaizon! Now let's see what he does. maybe we should all start speaking Spanish!!! Backing Chavez and his dictatureship against Obama ; if only Dominicans could realise what is going on and knew what Chavez said of the beloved Obama. Clearly our peurile PM has lost it. He obviously lacks focus; he fails to consult Dominicans (apart from a few cronies and sycophants) before engaging in these escapades; and he believes that by doling out galvanize and fertilizer he can grow the Dominican economy. Why does not he take the time to sit and reflect on his self-imposed stupidity and bovine desperation? It is interesting to note that apparently St, Vincent & the Grenadines have now also signed up for full membership of Alba. Taking Dominica and St. Vincent out of the ECCB would leave a population of some 386,000 spread over 6 territories using the E.C.$. If that were to happen these six could use the U.S.$. for every- day transactions (...which "de facto" is already happening in increasing volume), perhaps obviating the need for a separate Central East Caribbean Bank. We have been dancing around that "unity Chaudière" ever since the ill-fated Federation attempt over forty years ago, haven't we!?. It remains tantalizingly, waiting to be lit, on the "trois roches", while we keep furtively cooking our own little pots! What an uneducated article. Its only purpose is to deceive. Dominica is part of the ECCU and that is established in the Laws of Dominica. Dominica alone cannot leave the Union. There must be unanimity. That is all the other members must go to their Parliament and pass laws to allow Dominica to leave. Furthermore, Dominica must go to its Parliament to pass a law to change its currency or to leave the Union. The prospect of this happening is very slim. The Prime Minister has stated clearly and emphatically that he cannot sign on to the SUCRE because of the laws of Dominica. What is the real purpose of this article.